You'd expect a person to be at least in a celebratory mood while in the face of triumph. Winning indeed takes care of everything, like what Tiger Woods' Nike ad says. Especially when you've emerged victorious in something as monumental as a presidential race. Not for Rodrigo Duterte, it seems. Albeit still being unofficial, it looks like the Davao City mayor is set to become the 16th president of the Republic of the Philippines, holding a substantial lead over his rivals with roughly 10 percent of Election Returns left to be processed. At this point, Duterte must have started making arrangements for his imminent victory party (or another exorbitant happy-happy session that's maybe close to what we've cooked up), all while reveling in exalted glory. But here's what really happened: While most of us were sleeping soundly, he headed to his parents' grave at 3 a.m. on Tuesday, in the wake of some favorable partial election results. 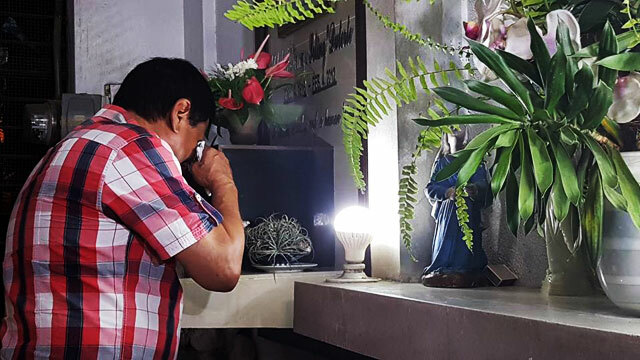 There, the tough-talking mayor bared a side of him rarely seen and cried while asking his folks, Vicente and Soleng, to "help him rule the country." We feel you, Digong. You still have a lot work to do for this nation.